New technologies have a tendency to blur boundaries and bring together areas of life which we once felt to be very separate. Consider the way social networks have removed the dividing line between what was once public and private and it�s easy to see how true this can be. For the photographer Karl Burke, another such blurring appears to be taking place today between the fields of entertainment and war. As young adults and even children descend every more frequently into violent virtual realities, and armies increasingly fight wars at enormous distances, mediated by computer screens and console controllers, these two very different arenas seem to be coming closer together. In Harvest of Death, Burke enters into online first person shooter games which use contemporary conflicts in Iraq and Afghanistan as backdrop for their gameplay. 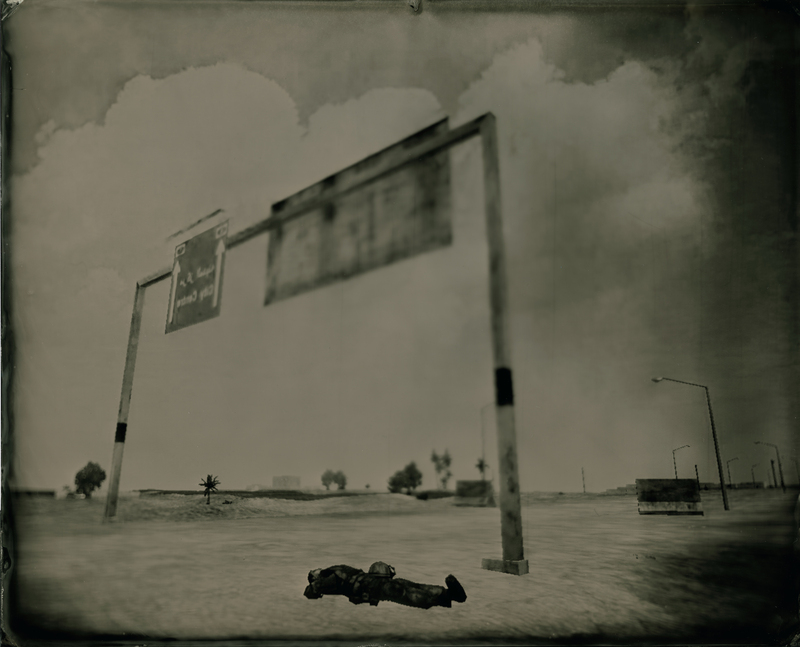 Taking on the role of a �simulated photographer�, he then takes screenshots of the aftermaths of in-game deaths. 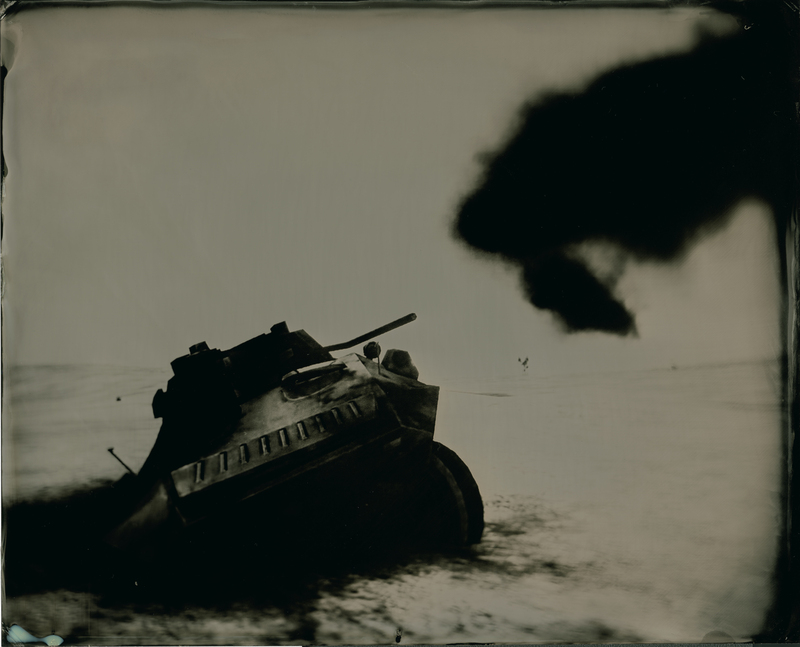 Burke felt it was important the photographs be physical artefacts, and so these screenshots were printed and re-photographed with the collidon wet plate process used by pioneering conflict photographers like Alexander Gardner. The title of Burke�s project itself derives from a Gardner photograph of 1863, showing the aftermath of the Battle of Gettysburg, the bloodiest of the American civil War. Burke�s resulting photographs feel as if they span different eras and places. Their subdued collidon colours and shallow depths of field are reminiscent of nineteenth century war photography, but the events they depict could only be those of the wars of the early twenty-first century. In the end, though, they are neither; they depict no time and place, only a simulation unfolding inside a computer for the purposes of entertainment. They show battles with no conclusion, instead repeating endlessly, where players are killed and �respawned� ad infinitum. Explaining the ideas that led to the project, Burke describes noticing the process of desensitisation that forms part of modern military training, and sensing that there were certain parallels with video gaming. Where once armies had to wait until the point of recruitment and conscription to begin moulding people into useful soldiers, Burke suggests the entertainment industry does some of the work beforehand. The military, for their part, have gradually recognised and adapted to the gaming talents of young adults, increasingly fielding weapons systems with controllers that are often indistinguishable from those of commercial games consoles. Burke�s photographs draw a stark contrast between societies with the luxury of lasting peace, where it has become possible to look on war as a form of entertainment, and those societies where the reality of war and death are very real ones. Equally, though, when one considers the growing use of video games as military recruitment tools, those simulated corpses might be ghostly premonitions of the fates of some of those young gamers who might grow up to find themselves one day fighting a war � with no option to respawn. See more of Karl�s work here.